If this is your first encounter with scallops, allow us to make the first introduction: they are meaty, slightly sweet, and easy to prepare mollusks typically enjoyed even by those who aren’t big fans of seafood. 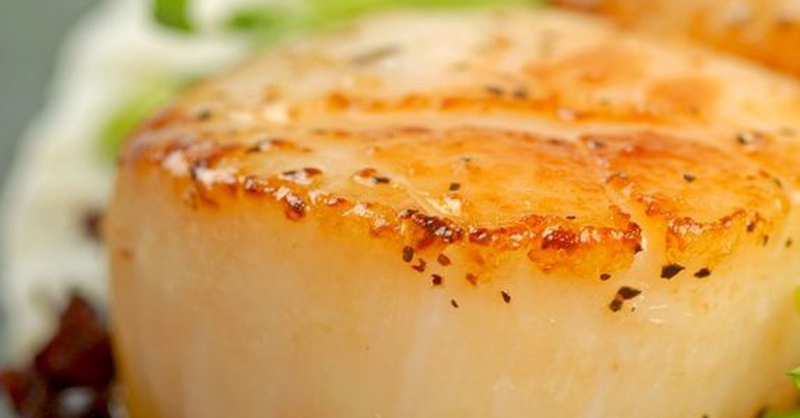 Depending on the size and quantity of scallops, they can make great appetizers or a romantic main course, and pair wonderfully with a Sauvignon Blanc or a slightly fruity Rosé. Remove the tough muscle from the side of the scallop. Some scallops are sold with this already removed. Heat a skillet over medium-high heat for 1 to 2 minutes. Add the oil and butter. Heat until decently hot. Pat the scallops dry once more, then add onto the pan in a single layer. Do not over-crowd. Let sear for 1 to 1 minutes. Using tongs, turn the scallops and let sear until the other side is equally browned (another 1 to 2 minutes). Scallops should be almost firm to the touch when done. Remove the scallops from the pan onto a plate, and set aside to keep warm. Return the pan to the stove and lower the heat to medium. Add 1/2 tablespoon of butter and the shallots. Sauté for about a minute. Add the wine and simmer until reduced by half. Add the herbs and lemon zest, then reduce the heat to low. Add the remaining butter, and whisk constantly until all the butter is melted. Return the scallops briefly to the pan, and gently roll them in the sauce. Taste the sauce, and add more salt and pepper to taste. Serve with arugula or lettuce and lemon wedges.